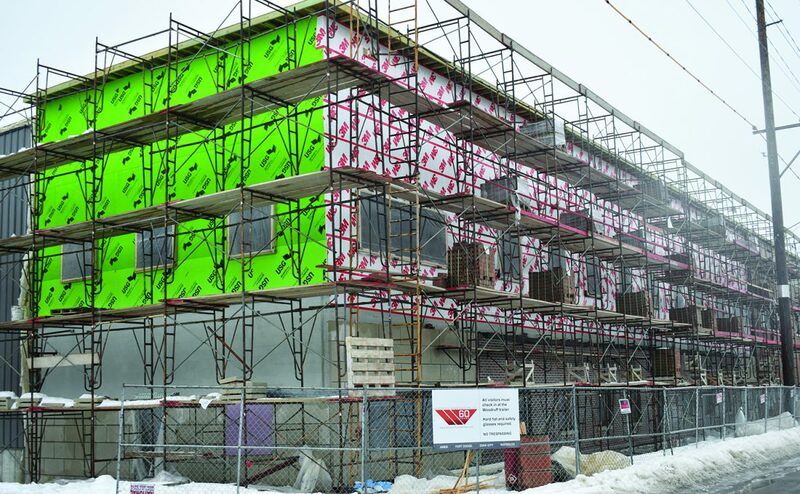 T-R PHOTO BY MIKE DONAHEY - Shown is a portion of the local Marshalltown Co. expansion project under construction. A “serious” citation and penalty was issued to Bridge City Construction for a fatal accident on the site in December. A “serious” citation and penalty was issued to a subcontractor for a fatal accident on a Marshalltown job site, records show. Ottumwa-based Bridge City Construction is working in Marshalltown as a steel erector subcontractor at the local Marshalltown Co. expansion project. Bridge City Construction employee Chris Ehrenhard, 37, of Ottumwa died in a December accident at the site. The document from Iowa OSHA listed the violation as serious. Ehrenhard was operating an aerial lift to lay out a roof pattern across structural steel beams on top of the building, according to OSHA documents. The way he was operating the lift pinned him against the beam and controls of the aerial lift, causing fatal injuries. The subcontractor did not provide effective training to the employees regarding the hazards that were associated with the job site, such as ground conditions and overhead hazards, according to OSHA. CONTRIBUTED PHOTO FROM CHRISTOPHER BRAUNSCHWEIG/NEWTON DAILY NEWS - Protesters gather in front of a construction site on Iowa Speedway Drive for a demonstration for workers’ rights in Newton last July as part of the strike from Bridge City Construction. A penalty of $3,880 was also issued by OSHA, due Monday. 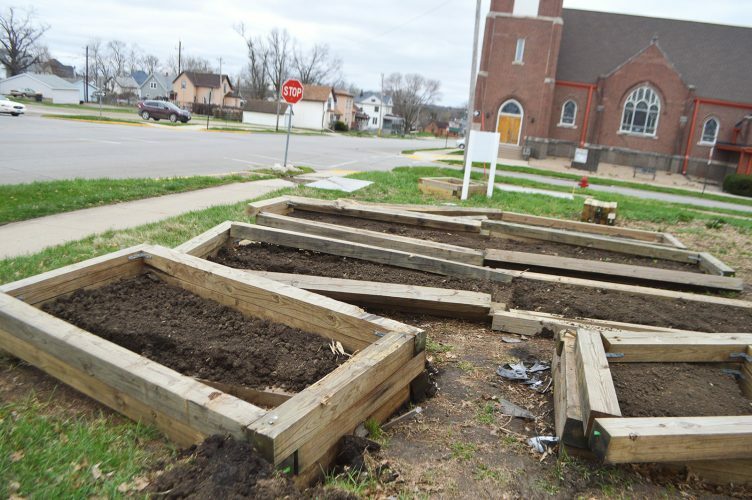 Bridge City Construction owner Jason Blunt told the Times-Republican shortly after the incident he could not comment because of the investigation. Reached again this week, he declined comment. It is unclear if he will contest the penalty. Peddy declined to provide further comment on the citation because the case is still open. “Marshalltown Co. extends sincere condolences to the family, friends and co-workers of the construction worker who was the victim of a a fatal accident while working for a subcontractor hired to complete our building expansion,” John Christen of Marshalltown Co. said after the incident in December. Construction workers Jorge Martinez of Ottumwa and William Ragen of Martinsburg allege numerous unsafe working conditions at Bridge City Construction worksites as a key reason, among other issues, for going on strike against the company June 15. Martinez and Ragen were joined by three members of the Tri-State Labor Coalition in a recent interview with the T-R in which they outlined safety issues with Bridge City Construction. Martinez, Ragen and Tri-State Labor Coalition members Stu Steffens and Clark Palmer are working to raise awareness about Bridge City Construction’s alleged labor practices and gain local support for the strike. The men allege lack of instruction in operating heavy equipment, access to safety and skills training, lack of basic safety equipment such as harnesses and absence of proper tools. They claim employers are required by law to provide protective equipment necessary, and Bridge City Construction has been inconsistent in providing it. The two said they, and other workers have been forced to pay for safety equipment themselves, sometimes through unauthorized deductions from paychecks. Ragen, who was actively employed for nearly three years as a general laborer also alleged mis-classification of employment status, resulting in the loss of wages. He cited the company’s failure to pay medical bills resulting from on-the-job accidents. Steffens said Bridge City Construction was trying to evade fair pay by classifying Bridge City Construction employees as 1099 employees, or independent contractors. Failure to be reimbursed for medical treatment resulting from on-the-job injuries is cited as another key grievance. Ragen said a tooth was chipped while working on the job, and company owner Blunt allegedly instructed him to go to a dentist, and Blunt would pay for it. The strikers and Tri-State Labor Coalition allege Bridge City Construction breaks the law repeatedly concerning the strikers’ grievances. While no picketing or demonstrations have been held locally, Martinez, Ragen, Tri-State Labor Coalition and other support groups protested and aired grievances at Bridge City Construction work sites in Newton and Ottumwa last year. Martinez and Ragen said they hold no grievances against current or former Bridge City Construction employees. “We have disagreements only with owner Jason Blunt,” Ragen said. Steffens said company employees, the Tri-State Labor Coalition and community supporters have tried to reach an agreement with Bridge City Construction to address safety and worker injuries, and a lack of affordable benefits, but have not been successful. T-R PHOTO BY MIKE DONAHEY – Shown is a portion of the local Marshalltown Co. expansion project under construction. A “serious” citation and penalty was issued to Bridge City Construction for a fatal accident on the site in December. 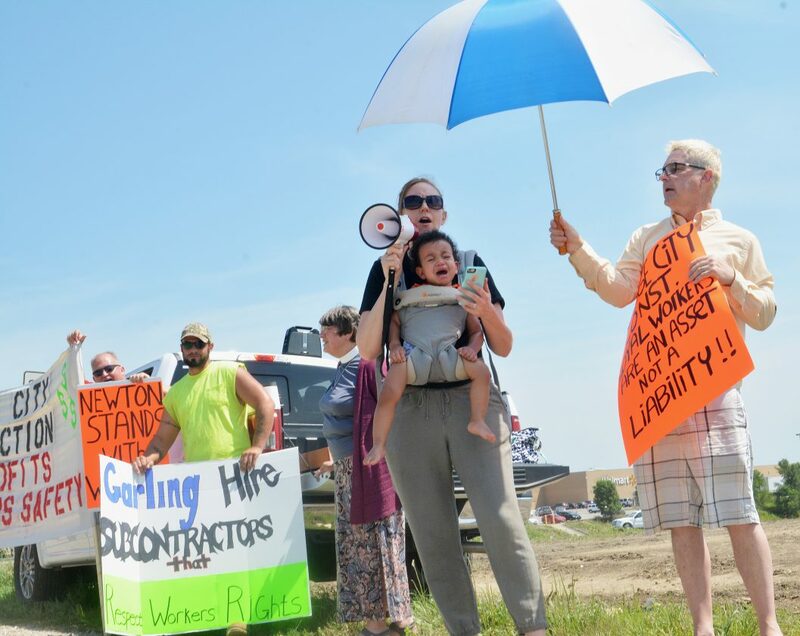 CONTRIBUTED PHOTO FROM CHRISTOPHER BRAUNSCHWEIG/NEWTON DAILY NEWS – Protesters gather in front of a construction site on Iowa Speedway Drive for a demonstration for workers’ rights in Newton last July as part of the strike from Bridge City Construction.